Early morning finds me working the bands from my camp in the badlands of southeastern Alberta. I spent several days wandering up and down backroads playing radio while looking for old homesteads to work with my metal detector. Of course you need to sleep on occasion, so I set up this camp in a likely looking spot overlooking the Red Deer river that meanders through these badlands near Jenner Alberta. 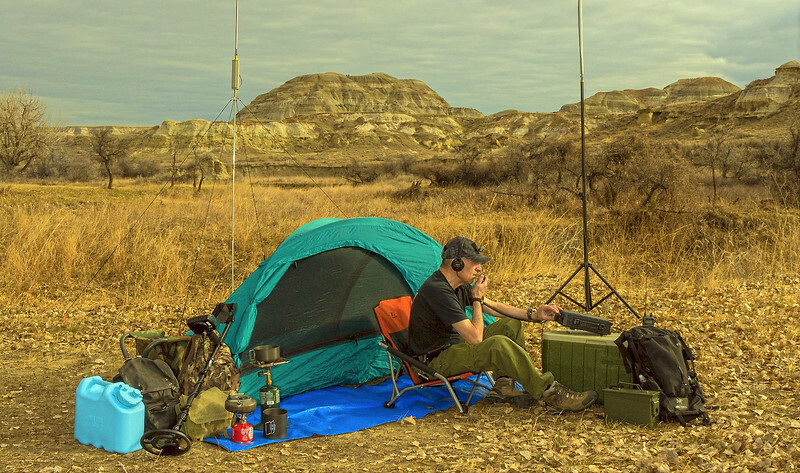 Besides putting in time at the mic of my HF rig mounted in my mobile while going down the road, I was also keeping a look out for a good location to operate from on Field Day this coming June, and I am quite pleased with how well this location worked out for a field day operation. On this day I had my 10-60 meter prototype vertical pack antenna set up as seen on the left, and I had my new 50MHz horizontal loop prototype antenna mounted on the tripod to the right. The Yaesu FT-897D with its two rear panel mounted antenna couplers allows both antennas to be connected simultaneously. I should mention that as per usual when I'm away from my home base, I have my emergency preparedness go kit along with me, that includes amongst other things the Scepter military water can seen in the photo. As far as food goes, I brought along the food I felt I needed for the 2 days I would be away from home.